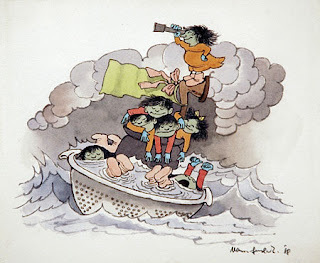 My latest One Clover & a Bee column is live over at Hilltown Families, in which I celebrate nonsense and bad behavior via Edward Lear and Maurice Sendak’s, “The Jumblies” (which Pokey believes is actually a poem about being an artist) as well as other poems for families to learn & love in the collection, Sing a Song of Popcorn. I just got this book out of the Library for my 4 year old son. We read it almost every day. Like you, we LOVE the Jumblies. In a sieve! Thanks for the wonderful recommendation. So glad you guys are enjoying it. Yay Jumblies!